Yves here. This short post extracts key findings from a new study by Americans for Tax Fairness and the Economic Policy Institute. We liked the summary and include it immediately below. One thing to keep in mind: taxes are a big element of economic policy by default, as in that they provide incentives and disincentives. The fact that Big Pharma and tech companies lower their tax rates through the use of clever structuring and tax havens and report higher profits is an economic privilege relative to other industries. While the statutory tax rate on corporate income is 35 percent, estimates of the rate corporations actually pay put the effective rate at about half the statutory rate. Driving this divergence between what corporations are supposed to pay and what they actually pay is a combination of offshore profit shifting and tax avoidance. Multinational corporations pay taxes on between just 3.0 and 6.6 percent of the profits they book in tax havens. And corporations have become increasingly adept at making their profits appear to be earned in these tax havens; the share of offshore profits booked in tax havens rose to 55 percent in 2013. Almost half of offshore profits are held by health care companies (mostly pharmaceutical companies) and information technology firms. Because of the inherent difficulty in assigning a precise price to intellectual property rights, it is relatively easy for these companies to manipulate the rules so that U.S. profits show up in tax havens. The use of offshore profit-shifting hinges on a single corporate tax loophole: deferral. Multinational companies are allowed to defer paying taxes on profits from an offshore subsidiary until they pay them back to the U.S. parent as a dividend. Proponents of cutting the corporate tax rate refer to profits held offshore as “trapped.” This characterization is patently false. Nothing prevents corporations from returning these profits to the United States except a desire to pay lower taxes. In fact, corporations overall return about two-thirds of the profits they make offshore, and pay the taxes they owe on them. Further, there are numerous U.S. investments that these companies can undertake without triggering the tax. In short, deferral provides a mammoth incentive for multinational corporations to disguise their U.S. profits as profits earned in tax havens. And they have responded to this incentive: 82 percent of the U.S. tax revenue loss from income shifting is due to profit shifting to just seven tax-haven countries. Firms have also become increasingly adept at manipulating the rules here in the United States to avoid taxation. Lower tax rates on “pass-through” business entities and poor regulatory responses have given firms the chance to reorganize as “S-corporations” or opaque partnerships in order to avoid paying any corporate income tax at all. This intentional erosion of the U.S. corporate income tax base has real consequences. Rich multinational corporations avoiding their fair share of U.S. taxes means that domestic firms and American workers have to foot the bill. It also means that corporations are not paying their fair share for our infrastructure, schools, public safety, and legal systems, despite depending on all of these services for their profitability. 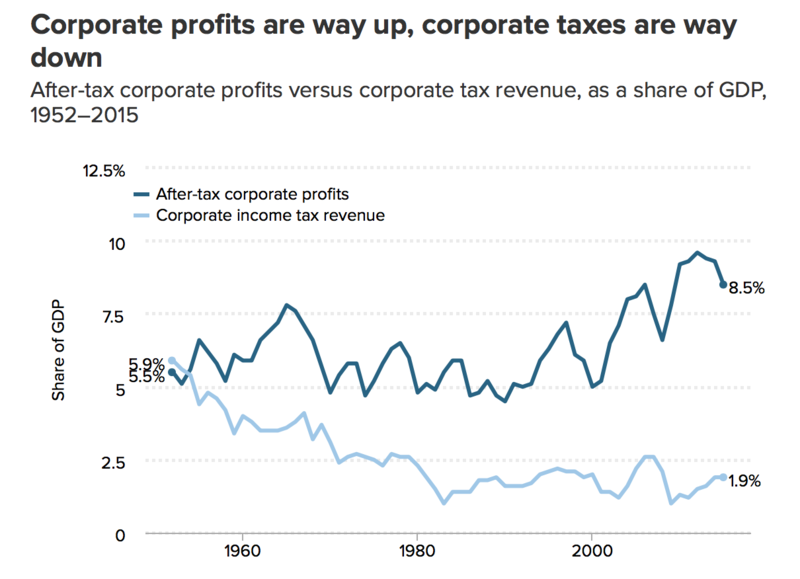 Corporate profits are way up, and corporate taxes are way down. In 1952, corporate profits were 5.5 percent of the economy, and corporate taxes were 5.9 percent. Today, corporate profits are 8.5 percent of the economy, and corporate taxes are just 1.9 percent of GDP. Corporations used to contribute $1 out of every $3 in federal revenue. Today, despite very high corporate profitability, it is $1 out of every $9. 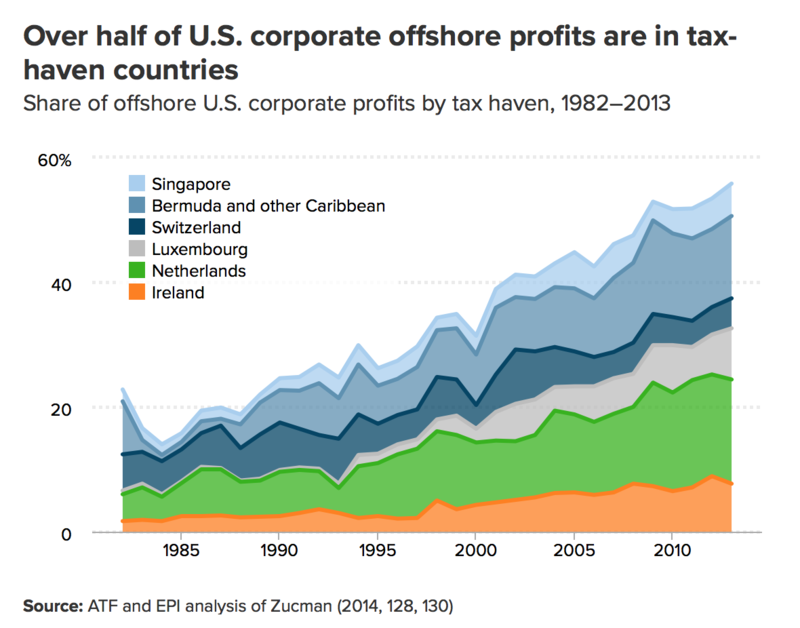 As of 2015, U.S. corporations had $2.4 trillion in untaxed profits offshore. Another study, looking at S&P 500 companies, found they held $2.1 trillion as of 2014. This roughly five-fold increase from $434 billion in 2005 stems largely from anticipation of a tax holiday. Just two industries—high-tech and pharmaceutical/health care—hold half the untaxed offshore profits. This entry was posted in Banana republic, Guest Post, Income disparity, Social policy, Taxes, The destruction of the middle class on September 23, 2016 by Yves Smith. and a highly trained workforce. 2. DoD. But funding and fighting in the Forever War is for little people. What about mergers. Do they not only facilitate monopolies but tax evasion? The IP stuff, the inverted balance sheets of those companies and their opaque allocation of revenues is the “dark matter” economists talk about euphemistically? I presume these offshore profits are not held in cash but are moved into U.S. Treasury bonds and other investments. What happens to the profits and losses from those? Are they eventually returned to the U.S. and taxed? Yves: Thanks for this. Still another area of bipartisan connivance and neglect. And there is a real irony about the Netherlands, which has been doing a lot of virtual signaling with regard to Greece (especially) and Italy, being a major tax haven. I guess that it is easy to balance the budget with all of that funny money floating around. Luxembourg? My solution is just to give it to France as a new département. Robert Hahl: Don’t count on profits not being held in cash. There are some indications, and Yves has published posts about them, that companies indeed are hoarding cash. You do not have to leave your backyard to find the same tax avoidance built into the capitalist system. Here in Philadelphia, during a 2nd wave of large scale real estate investment in the 10s of $Billions$, property is sold off for development parcels or after the development is completed, fully rented and a juicy source of rental for years and years to come. You would think the city government would reap some kind of windfall, that the school district funded by annual real estate taxes based on market value, but of course, the crony capitalism assures that tax avoidance strategies, all perfectly legal due to the laws written by the 1%, the self dealing loopholes will prevail. Now, a very successful real estate developer got himself elected to city council, along with a long suffering republican chamber of commerce guy. And THEY want to close some of the long standing loopholes that may have cost the city as much as $24Mil last year alone. Plus the ongoing depressed valuation used for the annual real estate tax bill. Immanuel Wallerstein in his lectures has pointed the 3 main obstacles to profits that the Global Capitalist System must control in order to sustain growth. 2. The costs of wages and ancillary benefits such as social insurances for health, unemployment, and eventual retirement. This article speaks directly to #3, as does my local example. The ongoing war on tax avoidance as a necessary standing policy by capitalists is on the local, national and international levels. The universal rule of law begs the questions, who writes these laws, who interprets these laws, who benefits from these laws and why do they never change in a way that gives meaning to the authority of government as having authority to rule. The pretense that tax loopholes are perfectly legal is critical to maintain the social order and belief in the rule of law. When tax laws are rendered useless by legal mumbo jumbo, the authority of the state to govern must be called into question as well! When people out in the street riot, loot and vandalize to show political dissatisfaction, that is criminal behavior, not legal, and has no loophole to excuse them. There is no question that the state must step in with its full power and authority and enforce the law, which is crystal clear in the case of rioting. There is no question that even local government must seek reinforcement from the military. Imagine a lawyer saying: “Well, the rioters are adopting a perfectly legal strategy of prosecution and jail avoidance by massing in numbers so large that they all can not be arrested, tried and convicted. WOW Paul: why are you not writing for/with NC & Yves? Excellent commentary! That seem unliky as S corporation cannot be owner by other corporations and are limited to 100 shareholders. Can you clarify that point, and explain further? On the one hand, Tax Justice Network is often fuzzy (as in wrong) on technical tax details. Tax is fiendishly complex. But on the other hand, the general idea that there may be ways to structure around this isn’t crazy. As I recall, for instance, if I recall correctly, the publicly-traded PE firms are legal entities that own (or own the cash flows) of general partnerships. So the government is subsidizing corporate profits through tax breaks, loopholes, and non-enforcement. This has the overall effect of re-distributing the wealth towards the upper end of the income spectrum and sponsors the creation of millionaires and billionaires. Who would have a problem with that? That’s not class warfare at all says this temporarily embarrassed trillionaire. How long will it be before an actual “trillionaire” emerges, I wonder ? i bet if you had a “birds-eye” view of all the money in all the accounts, both her and overseas, and ownership of shell companies stock, and on and on, you would find that that person exists already. Don’t the mega-corporations write the thousands of pages of our corporate tax code? Congress just rubber stamps it, right? Can’t remember where I read it, but it has been suggested that the supposedly high corporate tax rate is there by design. The biggest players write in all the loopholes they need and more, burdening the small fry with the nominal rate and thus squelching any competition that the big guys might face from lesser competitors.